Gifts of support less than $2.00 are not able to be processed online. With explosive facts, it explains why 60 million Americans have been led to Eastern mysticism’s “embrace that smothers,” exchanging the certain hope of salvation for the hopeless cycle of reincarnation. 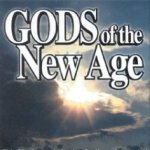 Gods of the New Age reveals why thousands of churchgoers have begun to believe the lies first told by the serpent in the Garden of Eden…Why yoga, meditation, psychological therapy and self-help are turning millions to a pagan worldview…How the west is being intentionally evangelized by eastern mystics and New Age visionaries. This film explores the eerie world of egomaniacal gurus and their western counterparts, New Agers. In a series of exclusive, candid interviews, we share the thoughts of “master” and witness the blind devotion and mindless obedience of “disciple.” Gods of the New Age takes us from a clandestine, early sixties planning meeting held by Indian gurus to today’s dignified US corridors, American schoolrooms and Christian churches. The film uncovers the chilling parallels between today’s Western culture and the similar climate that bred Hitler’s Third Reich a generation ago!